If exact dosing is required for injection or aspiration drilled bores are suitable. If fragmentation-free piercing of membranes for injection or aspiration is required machined bores are suitable in connection with closed needle points. Knurled tubes guarantee secure embedding in plastic components. We offer several options for grooves. Beadings are ideal for hose connections. Slotted tubes are often used for spray systems. Markings are usually produced through an electrochemical etching procedure. The smooth surface of the material remains the same during this process. Reduced ends are used for several products and may lower the penetration force with cannulae. Please note that wall thickness may be affected in the reduced area. Flared ends guarantee secure embedding in plastic components in the axial direction.. The flared end diameter is determined by the ratio of tube OD and wall thickness. Micro-blasted areas are used for a better glue joint with plastic components. Micro-blasted areas on the needle point are used as echo sound markings for ultrasonic examination. Inner and outer threads are produced for screwed joints. 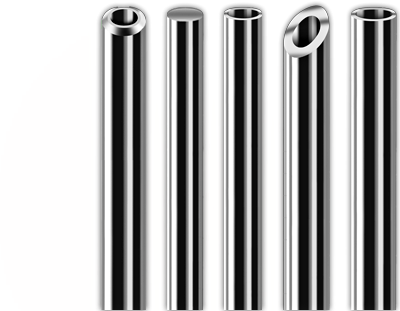 In cooperation with laser specialists we offer laser welded tubular components. The radius of bend depends on the ratio of tube OD and wall thickness.